It's nice to hear that Brown — who only found out he was a father in February — is being mature about the whole situation and wants to ensure his daughter has a stable father figure in her life, especially given that Chris didn't have the best time growing up and previously admitted that he used to have to watch his stepfather beat his mother. “Chris doesn't know what it's like to be a good father because he wasn't taught that as a child, but he knows he has to show up for his daughter and let her know that her father loves her, which he does,” the source added. But since learning he fathered a child, the Loyal singer "calls Nia regularly and now says he wants to openly participate in raising the baby,” according to TMZ. "Chris says he'll gladly fly regularly to parent Royalty in Texas, where she and Nia currently live." Claims that the rapper wants joint custody of his love child come just a few days after reports claimed he threatened to reduce the amount of child support he currently pays Nia, after she blabbed about their daughter to the press. According to TMZ, Chris struck up a deal with Nia that meant he would pay far more than the required monthly child support in exchange for her silence. After the news broke, the revelation cost him his on/off girlfriend, Karrueche Tran. Sources have also alleged that the rapper is preparing to take legal action, as he believes his baby mama is leaking stories about him to the press. Sadly, it doesn't look like Chris will care too much about what Karrueche thinks about his new life as a baby daddy, after she publicly dumped him on Twitter on Wednesday (Mar 4) when hearing about his little indiscretion. "Listen. One can only take so much. The best of luck to Chris and his family. No baby drama for me," she wrote. Blur are the latest headliners for Benicassim 2015. Britney Spears is working on a new album. Madonna says older men are 'not dateable', reveals why she only dates young guys. 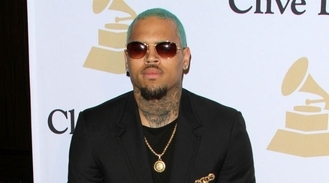 Chris Brown desperate to be in his daughter's life, fighting for joint custody. Bobbi Kristina Brown and Whitney Houston were murdered by relative Pat Houston, according to discredited cousin. Britney Spears and Kevin Federline have a "great" relationship. Calvin Harris has split from his girlfriend. Rihanna has "practically moved in" with Leonardo DiCaprio. 'I'm going to be a grandfather': Billy Ray Cyrus responds to Miley pregnancy rumours. Sam Smith and John Legend team up for Comic Relief song.